One of the hottest issues consuming most of the nation’s attention right now is the proposed repeal of the Affordable Care Act (ACA) or Obamacare. Regardless of your opinion on whether or not this is a smart idea, we can agree on two things – 1. It’s a highly complicated issue. And 2. Any outcome will have a profound impact on us all. Virtually every person, every business and every industry will be affected in some way if a massive change is made to healthcare. Commercial real estate is no exception. In order to stay afloat, hospitals, medical offices and ambulatory facilities will need to adapt the way they treat patients, which may mean making a change to the size and structure of their brick and mortar facilities. We can expect to see some interesting business strategies unfold as the healthcare industry reacts to the proposed repeal of the ACA and new GOP healthcare plan. 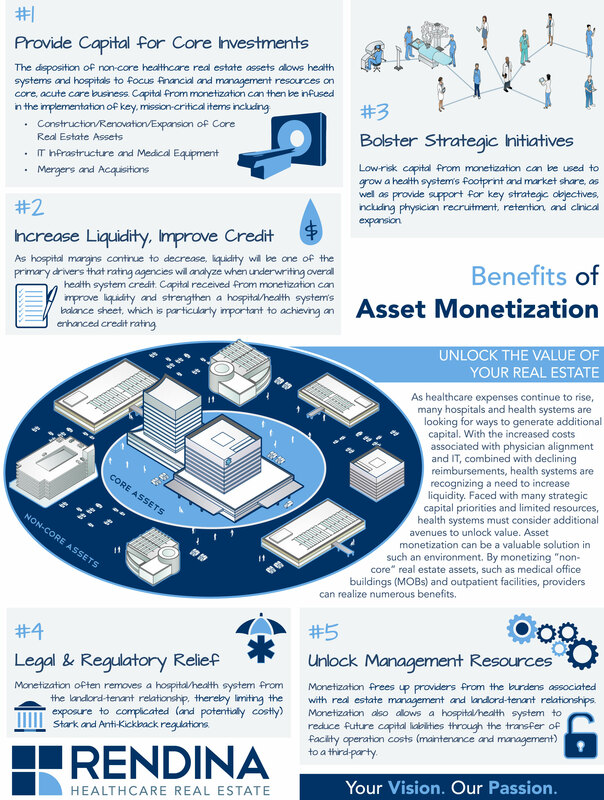 Based upon some of the movement already taking place in the healthcare industry, here is an overview of some of the changes we expect to see in commercial real estate. Earlier this month, associations representing nearly every type of hospital spoke out in strong opposition to the Republican plan to replace the ACA. As part of their argument, they noted that deep cuts in what hospitals are paid, while dramatically reducing coverage, will reduce their ability to provide essential care to patients and lead to tremendous instability. Simply put, more changes to an already struggling system could be enough to bring down this whole house of cards. Interestingly, the current climate of uncertainty does not appear to have significantly altered strategic planning on the part of health systems, as market participants indicate that real estate projects in planning phases continue to move forward. For example, Pinnacle is in the process of designing a $22 million addition for a new Women’s and Babies Center, and the Penn State Board of Trustees recently approved a $20 million plan to expand and renovate the Penn State Health Milton S. Hershey Medical Center Emergency Department. That being said, the proposed repeal of the ACA and the implementation of site-neutral legislation will significantly impact inpatient hospitals. Instead of expanding existing inpatient facilities, acute care providers will continue to look for off-campus opportunities within their community. In particular, we predict an increase in the construction of micro hospitals and other ambulatory facilities. For several decades, we have seen a shift away from the acute care setting, mostly driven by incentives and patient preferences, and this will most likely continue in the uncertainty of the healthcare industry right now. The challenges facing the acute care industry have also contributed to their consolidation, as hospitals seek greater negotiating power, scalability, and improved access to technology. A 2013 academic study found that more than half of all hospitals are now part of larger health systems! We are moving toward a small number of locally integrated health systems. While the streamlining and coordination of services is beneficial, this also comes with the drawback of potentially higher costs associated with greater market power. The concern of a perceived “monopoly” has come up a few times during proposed mergers and acquisitions. It’s the reason the FTC shut down the Hershey-Pinnacle Merger. However, an alternative merger between UPMC and Pinnacle is on the table and there is still concern that this could result in a monopoly, with Pinnacle operating two of the three hospitals in Cumberland County. Additionally, large, older hospitals are outdated and oversized, requiring innovative real estate strategies to determine how best to utilize these structures. One such innovative strategy is for hospitals to rent out unused floors and wings to another provider for uses such as long-term acute-care, inpatient rehab, skilled nursing, hospice, or behavioral health. Sharing space, and sharing in the cost of space, could prove to be an extremely valuable strategy to help hospitals keep their doors open, particularly as the healthcare industry reacts and adapts to whatever changes lie ahead for the ACA. Do you have a different view on how the repeal of the ACA and new GOP plan will impact healthcare real estate? Please share your thoughts by leaving a comment!